I think we’re all familiar with the saying, “It’s not you, it’s me!” and while I would love to claim that my disappointed feelings concerning this book stem from me, and not the book itself, I honestly don’t think I can. Yes, my unusually prolific knowledge on dystopian and science-fiction novels definitely played a role in my lack of amazement at the so-called creativity of this novel and that same understanding enabled me to predict the ending of this novel far before the half-way mark of this book was even reached, but overall, I really do think it’s the book as well, not just me. Yet, then again, with my reputation of being a black sheep, you could just say this book wasn’t for me, but who knows? Ultimately, the point is that Crewel was a disappointing read with a lot of potential which failed to live up to the immense amount of hype surrounding it. Wow, a dystopian novel where women control time? Awesome! Original! Creative! Riiight? Wrong. I’ve heard all those three words used to described this novel, but in reality, Crewel is no different from any other dystopian book. We have our classic government which controls everything, from who you marry to what you study to what you eat and how many children you have. We all know that dystopian novels are about fixing the wrongs on Earth and restoring control, so really, this is nothing new. Furthermore, the whole idea of being able to kill people at mere whim isn’t anything new either! Lois Lowry did it in The Giver, Kurt Vonnegut did it in his short story “2 B R 0 2 B” and I’m sure countless other authors have done it in the past as well. 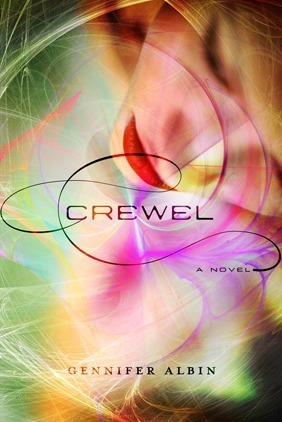 While I’m not denying that Crewel does have an immense amount of originality in its conception – which we see only after the 50% mark of this novel has been passed – for the most part, this story just focuses on a dystopian government like any other. If anything, I found it to be formulaic and extremely typical, which was all rather disappointing. Speaking of disappointments, I think the characters where what ruined this story for me. On the surface, Adelice is an amazing heroine – she’s a strong protagonist, she’s clever, she’s intelligent, and she sticks up for what she believes in. Yet, like any building, her foundation was off, which only made her overall character topple down as the story progressed. In Crewel, Adelice is credited for running away from The Guild on her own and for being a rebel – a role she quickly assumes without much reason. I think we were supposed to realize that the reason Adelice caused so much trouble was because her parents were killed, but this was hardly mentioned. It felt, to me at any rate, that she lacked true motivation for her actions and was falsely perceived as a rebel throughout the novel when she made it quite clear that she wouldn't have run away if it wasn't for her parents. Thus, the question for much of the novel which begs to be answered is why does Adelice do what she does and cause trouble for herself and for others as a Spinster when she doesn't even know why her parents hated The Guild? We never find out and while Adelice receives plenty of answers later, for the most part, her actions lack logical reasoning. In addition to Adelice though, the villains in this story were mediocre at best. If anything, they were predictable, unoriginal, and almost cartoon-like in their anger, misbehavior, and evil deeds. In general, they failed to impress me and didn’t add anything to this novel. Furthermore, they were vastly underdeveloped – much like the love interests in this story as well. Yes, that’s right, love interests, plural. We have, ladies and gentlemen, another love triangle on our hands! While this wasn’t as bad as some I’ve read previously, it was still extremely irritating. Still, I have to admit though that Jost was an extremely developed character and I loved him throughout the story, although I did think the “problem” between him and Adelice was way too easy to see coming. Erik, on the other hand, was as flat as paper and seemed to pine after Adelice for no reason, so that aspect of their romance irritated me. Overall though, the love triangle really could have been worse. Crewel is one of those novels that had so much potential, but just fell flat. I really loved the manner in which Albin revealed to us that this novel was a dystopian and some of the cruelty she exposed and horrors of the The Guild and the life in Arras were beautifully written, as was the character of Adelice’s mentor. Yet, despite all those good qualities, it still remains that this novel was predictable, contained mostly underdeveloped characters, lacked originality, and had an extremely slow pacing to start with. I feel as if so much of the beginning could have just been cut out and if the second half of this was better edited, it would have been a much better story. Unfortunately, I’m not sure if I’m going to continue with this series. I really do think I can predict most of what will occur in Book Two already, so that definitely does not bode well. If you haven’t read a lot of dystopian or science fiction novels in the past, I think this will blow you away, but if you have, this might just wind up being another typical dystopian story for you. Ultimately though, Crewel joins my pile of extremely disappointing reads – after all the hype, I think I was just expecting more. Thank you to NetGalley and MacMillan for providing me with a copy of this novel in exchange for a honest review! Sorry to hear you didn't enjoy this book all too much. I'm actually reading this one at the moment, so fingers crossed that I like it more than you did. Anyway nice and honest review! Thanks Erin! I hope you enjoy this one more than I did! I'll keep my fingers and toes crossed for you! Goodness. I was really looking forward to this book initially, but I must say I've been seeing some recent ho-hum reviews that give me pause. The concept is so cool, though! And that cover! But lackluster heroines and mediocre villains do not a good combination make. :/ Thanks for the review, Keertana. Thanks Elena! (: I was really looking forward to this one too, but I think I set the bar too high. I wound up being disappointed by it even though the writing is very beautiful. Ultimately, it was the plot and characters that brought it down for me, but I hope you enjoy it more than I do! I love badass villains too but these ones were so laughable that I wasn't impressed in the least. I really do hope you have a better experience with this novel than I did though, Jenny, so I'm keeping my fingers and toes crossed for you! I have read some rave reviews of this and am actually glad to see one that isn't raving. I may have had some high expectations before. And I think that your review actually has me more curious because you were so thorough in pointing things out. I appreciate that! I think that a unique concept can have a same ol' thing feeling to it, so it's too bad that it didn't feel more original to you. But thanks for the great, and honest, review! I'm picking this up soon and yours is one the first reviews I've seen.Thanks for sharing your thoughts, such a shame it was a sort of 50/50 for you. Haha, I think I can probably predict already most of what will happen in book 2 as well! Which IS disappointing, even coming from someone who really enjoyed this book. I'm almost afraid that there's no way this series WON'T fall into 2nd book syndrome (I will be reading it though, so I'll let you know :P). I'm sorry this one didn't work for you, but I can totally see why. Like I said, I've avoided dystopians for quite a while-in fact, I think the last I read was Matched about a year ago. I'm glad you liked Jost at least, I really liked him and totally felt for the guy. I like that he had a real history--although I had a hard time buying both his and Erik's positions, it all was just too convenient. I didn't like Erik either though, and he had no reason to be interested in Adelice other than 'oh she's pretty and off limit's. I didn't ever really feel like she had any feelings for him at least, which made the love triangle not so bad for me. But I'm just waiting for everything to get messed up in book 2. The 'reveal' to me about the boys was just annoying. Terrific book that immediately captured my attention. The audio was great and one that will be listened to again. Looking forward to following the series! Crewel is a dystopian gem; a unique and clever world that kept me riveted as I devoured the pages. Not only is the world-building captivating, but the characters are diverse and developed, having me either hating them or cheering for them. The politics was easy to follow, as well as some of the science, which I found to be refreshing. Although there is a cliffhanger, I was immensely satisfied with this book and am really anticipating the next one.